Given that Freelancer.com is the world’s biggest marketplace for freelance jobs, it sometimes feels like there are virtually an infinity of jobs posted and an infinity of people bidding on them. It might seem hard to be heard as a voice among millions, especially if you’re going after highly coveted projects that are worth thousands of dollars. Don’t despair, we have you covered - with these tips and tricks you’ll get up in the earning ranks in no time flat. It is essential to start with a great set-up. The best way to start is to get through all the required site verifications (phone, e-mail, payment, and identity) so that you do not have any hindrances in bidding or issues once you start working seriously. Add another layer of awesomeness by getting some certifications through Freelancer.com’s Skills Tests. You can show off your skills for everything from coding to languages, and keep in mind that some exams can be chosen as selection criteria for bidders. There are even projects where you can’t place bids if you haven’t taken the necessary tests. Once you have few great skills on display, it will be much easier to impress future employers. Your portfolio page is the place where you can set the stage and let your talents shine. A great portfolio contains a few key highlights about you and some examples of your greatest work. To make the page stand out, a professional looking picture will give potential clients a friendly face to associate with your profile and will lead them to the ‘Hire me’ button more easily. Make sure to fill your portfolio with varied examples of your work, to showcase the range of skills that you have. So, even though logos may be your specialty, make sure to display some brochures or packaging design as well, to give your portfolio a balanced look. Also, get out the stunners! Display the most interesting, technical, and expressive pieces you have in your portfolio and this applies to everything from writing to engineering. The employers want to see what you can do! You probably won’t be catching the big fish from day one, but start small and gather some steam, and you’ll be in the big leagues in no time. 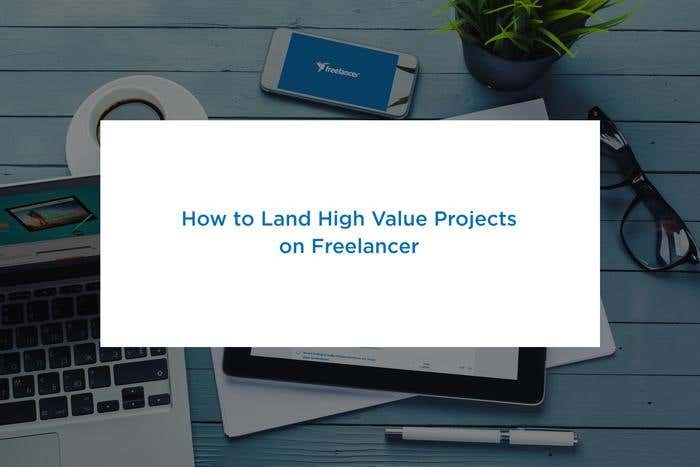 Besides having a great portfolio, Freelancer offers employers a multi-level ranking and reputation system, so that they can make informed decisions about who to hire for their projects. Create some momentum by doing smaller jobs with excellence, and getting in some reputation-building 5-star reviews. Once you have a few of those, it’s time to strike. With your stunning portfolio and the great reviews from your fawning previous clients, you’ll stand out and get noticed. Ok, now that you polished your aesthetics and have gathered a bit of a reputation, it’s time to go hunting for whales. It might take a few bids until you land a job, but the upside can be amazing. You just have to trust in yourself and present your best side. Try to always be professional when clients approach you and don’t sell yourself too hard. Once employers open a chat with you, they are already charmed by your portfolio and history on the site. Try to gather as much information about the project as possible, and communicate to them that you have understood and care about delivering the best output possible. The next step in attaining Freelancer mastery is applying to the Preferred Freelancer Program. This is a highly curated group of excellent freelancers, that comprise the top 1% in terms of reputation, level of service, and communication. You need to have a bit of a background already to apply, but once you get in, the possibilities are endless. You will be working alongside specialized Recruiters that will get to know you and your skillset and will be recommending you on fitting projects, also assisting the employer in awarding them to you. You’ll get access to the cream of the crop in terms of exclusive projects, and will be given the Preferred badge on your profile, to mark you as official ‘Freelancer royalty’.